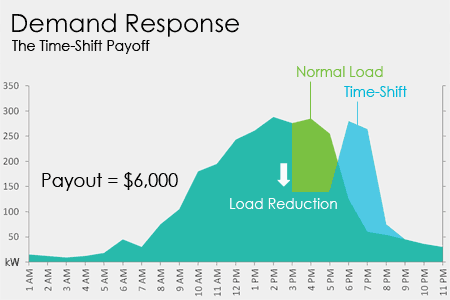 How does Demand Response pay? The electric grid has limited generation capacity, and runs with a set amount of headroom. Some days however are too taxing on the grid. In addition to the normal demand on the system, a heat wave has everyone turning up the AC. This demands more electricity–potentially beyond the system’s capacity, at which point brown-outs and rolling black-outs occur. To avoid this scenario, a system of incentives exists. This chart illustrates an “Event Day.” When called, the participants voluntarily shift their demand to an alternate time-frame. Here a medium-sized manufacturer shifts some demand to the evening and is awarded more than $6,000.